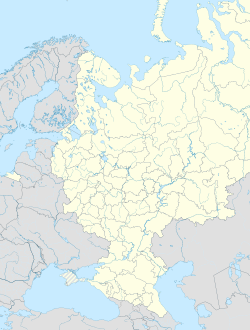 For other uses, see Yalta (disambiguation). Yalta (Crimean Tatar: Yalta; Russian: Я́лта; Ukrainian: Я́лта) is a resort city on the south coast of the Crimean Peninsula surrounded by the Black Sea. It serves as the administrative center of Yalta Municipality, one of the regions within Crimea. Population: 76,746 (2014 Census). The city is located on the site of an ancient Greek colony, said to have been founded by the Greek conquerors who were looking for a safe shore (γιαλός – yalos in Greek) on which to land. It is situated on a deep bay facing south towards the Black Sea, surrounded by the mountain range Ai-Petri. It has a warm humid subtropical climate and surrounded by numerous vineyards and orchards. The term "Greater Yalta" is used to designate a part of the Crimean southern coast spanning from Foros in the west to Gurzuf in the east and including the city of Yalta and multiple adjacent urban settlements. In the 19th century, the town became a fashionable resort for the Russian aristocracy and gentry. Leo Tolstoy spent summers there and Anton Chekhov in 1898 bought a house (the White Dacha) here, where he lived till 1902; Yalta is the setting for Chekhov's short story, "The Lady with the Dog", and such prominent plays as The Three Sisters were written in Yalta. The town was also closely associated with royalty. In 1889 Tsar Alexander III finished construction of Massandra Palace a short distance to the north of Yalta and Nicholas II built the Livadia Palace south-west of the town in 1911. During the 20th century Yalta was the principal holiday resort of the Soviet Union. In 1920, Vladimir Lenin issued a decree "On the Use of Crimea for the Medical Treatment of the Working People" which endorsed the region's transformation from a fairly exclusive resort area into a recreation facility for tired proletarians. Numerous workers' sanatoria were constructed in and around Yalta and the surrounding district. There were, in fact, few other places that Soviet citizens could come for a seaside holiday, as foreign travel was forbidden to all but a handful. 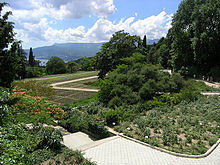 The Soviet elite also came to Yalta; the Soviet premier Joseph Stalin used the Massandra Palace as his summer residence. Yalta was occupied by the German Army from 9 November 1941 to 16 April 1944. The town came to worldwide attention in 1945 when the Yalta Conference between the "Big Three" powers – the Soviet Union, the United States and the United Kingdom – was held at the Livadia Palace. Following the dissolution of the Soviet Union in 1991, Yalta has struggled economically. Many of the nouveaux riches of ex-Soviet citizens began going to other European holiday resorts, now that they had the freedom and money to travel; conversely, the impoverishment of many ex-Soviet citizens meant that they could no longer afford to go to Yalta. The town's transport links have been significantly reduced with the end of almost all passenger traffic by sea. The longest trolleybus line in Europe goes from the train station in Simferopol to Yalta (almost 90 km). Yalta is crowded in the vacation season (July–August) and prices for accommodation are very high. Most of the tourists are from countries of the former Soviet Union; in 2013, about 12% of tourists to the Crimea were Westerners from more than 200 cruise ships. Yalta has a beautiful seafront promenade along the Black Sea. People can be seen strolling there all seasons of the year, and it also serves as a place to gather and talk, to see and be seen. There are several beaches to the east and west of the promenade. The town has several movie theaters, a drama theater, plenty of restaurants, and several open-air markets. Two beaches in Yalta are Blue Flag beaches since May 2010, these were the first beaches (with two beaches in Yevpatoria) to be awarded a Blue Flag in a CIS member state. 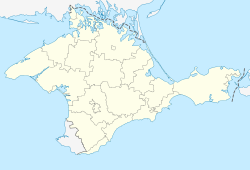 Crimea was annexed by Russia in early 2014 and the peninsula, Ukrainian territory since 1991, is now administered as two Russian federal subjects - the Republic of Crimea and the federal city of Sevastopol. The international community has overwhelmingly condemned the Russian Federation's acts in the Autonomous Republic of Crimea and the city of Sevastopol. United Nations General Assembly Resolutions 68/262 of 27 March 2014 , 71/205 of 19 December 2016  and 72/190 of 19 December 2017  confirmed the status of the Autonomous Republic of Crimea and the city of Sevastopol as part of the territory of Ukraine, condemned the occupation of Crimea by the Russian Federation and reaffirmed the non-recognition of the annexation of Crimea by the Russian Federation. The United Nations also called upon all States, international organizations and specialized agencies not to recognize any alteration of the status of the Autonomous Republic of Crimea and the city of Sevastopol and to refrain from any action or dealing that might be interpreted as recognizing any such altered status. Yalta's Sea Promenade (Naberezhnaya), housing many attractions, which was renovated in 2003 and 2004. As Yalta lies to the south of the Crimean Mountains and, within an amphitheatre of hills, the climate is mild. Yalta has a humid subtropical climate (Köppen climate classification: Cfa) that closely borders on a Mediterranean climate. In February, the average temperature reaches 4 °C (39 °F). Snow is infrequent and melts soon thereafter. In July, the average temperature reaches 24 °C (75 °F). The average annual precipitation is 612 millimetres (24.1 in), most of it being concentrated in the colder months. The sun shines approximately 2,169 hours per year. Since the city is located on the shore of the Black Sea, the weather rarely becomes extremely hot due to the cool sea breezes. The average annual temperature for Yalta is 13 °C (55 °F). As of the Ukrainian Census conducted on 1 January 2001, the population of Yalta is 80,500. The main ethnic groups of Yalta are: Russians (65.5%), Ukrainians (25.7%), Belarusians (1.6%), and Crimean Tatars (1.3%). The predominant language in the streets of the city is Russian. This total number does not comprise the population of neighbouring villages and small towns. The metropolitan area population is about 139,500. ^ English approximation of the name: UK: /ˈjæltə, ˈjɔːltə, ˈjɒltə/, US: /ˈjɔːltə/ ( Wells, John C. (2008), Longman Pronunciation Dictionary (3rd ed. ), Longman, ISBN 9781405881180 ). ^ a b Kottek, M.; J. Grieser; C. Beck; B. Rudolf; F. Rubel (2006). "World Map of the Köppen-Geiger climate classification updated" (PDF). Meteorol. Z. 15 (3): 259–263. doi:10.1127/0941-2948/2006/0130. Retrieved 28 August 2012. ^ "Климат Ялты" (in Russian). Погода и климат. Retrieved 28 November 2015. ^ "Jalta (Yalta) Climate Normals 1961–1990". National Oceanic and Atmospheric Administration. Retrieved 28 November 2015. ^ Central Statistical Office of AR Crimea, see «Ялта», column №3. ^ "Villes jumelées avec la Ville de Nice" (in French). Ville de Nice. Archived from the original on 2012-10-29. Retrieved 2013-06-24. "Yalta" . New International Encyclopedia. 1905. The murder of the Jews of Yalta during World War II, at Yad Vashem website. Livadiya is an urban-type settlement in Yalta Municipality of the Autonomous Republic of Crimea; a territory recognized by a majority of countries as part of Ukraine but incorporated by Russia as the Republic of Crimea. It is located 3 kilometres (1.9 mi) west of Yalta. Population: 1,074 . Koreiz is an urban-type settlement lying south-west of Yalta in the Yalta Municipality of the Autonomous Republic of Crimea, a territory recognized by a majority of countries as part of Ukraine and incorporated by Russia as the Republic of Crimea. The name of the town means "villages" in Greek. Koreiz absorbed the nearby spa of Miskhor in 1958. Population: 5,455 . Massandra or Masandra is an urban-type settlement in the Yalta Municipality in Crimea. Partenit is a seaside urban-type settlement under the administrative jurisdiction of the town of regional significance of Alushta in the southern part of the Autonomous Republic of Crimea, a territory recognized by a majority of countries as part of Ukraine and incorporated by Russia as the Republic of Crimea. Population: 6,193 . Krasnokamianka is a resort and urban-type settlement in Yalta Municipality in the Autonomous Republic of Crimea, a territory recognized by a majority of countries as part of Ukraine and incorporated by Russia as the Republic of Crimea. Population: 1,051 . Gaspra is a spa town, an urban-type settlement in Yalta Municipality in the Autonomous Republic of Crimea, a territory recognized by a majority of countries as part of Ukraine and incorporated by Russia as the Republic of Crimea. 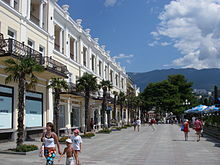 It is located on the Black Sea coast, west of Yalta, and is a popular holiday resort. Population: 10,310 . Foros is a resort town in Yalta Municipality of the Autonomous Republic of Crimea, a territory recognized by a majority of countries as part of Ukraine and incorporated by Russia as the Republic of Crimea. Population: 1,844 . 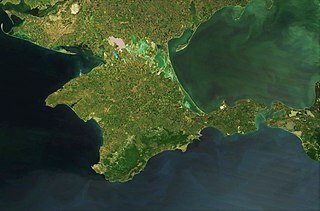 The Crimean Peninsula is a disputed area which as a result of the 2014 Crimean crisis is controlled and recognized by Russia as the Republic of Crimea, a federal subject of Russia. At the same time, Ukraine and nearly all countries around the world recognize the territory as the Autonomous Republic of Crimea, a part of Ukraine. Otradnoye or Vidradne is an urban-type settlement in the Yalta municipality of the Autonomous Republic of Crimea, a territory recognized by a majority of countries as part of Ukraine and annexed by Russia as the Republic of Crimea. Sovietske is an urban-type settlement in the Yalta Municipality of the Autonomous Republic of Crimea, a territory recognized by a majority of countries as part of Ukraine and annexed by Russia as the Republic of Crimea. Danylivka is a rural settlement in the Yalta Municipality of the Autonomous Republic of Crimea, a territory recognized by a majority of countries as part of Ukraine and annexed by Russia as the Republic of Crimea. Hirne is a rural settlement in the Yalta Municipality of the Autonomous Republic of Crimea, a territory recognized by a majority of countries as part of Ukraine and annexed by Russia as the Republic of Crimea.